We’re lowering our minimum initial investment requirement for children of clients who hold an account directly with us. The minimum is being reduced from $10,000 per fund to $1,000. Note that this applies to children who have reached the legal age to open an account. We have minimum investment requirements in place to keep our transaction and administrative costs in check, which enables us to keep our fees low. We’re introducing this exception in recognition that it can be difficult for younger investors to meet our minimums. The greatest advantage any investor can give themselves is time. And with it, the power of compounding (making money on your money). The earlier you get started, the better. Consider two investors, Jessica and Chuck. Jessica is 20 years old; Chuck is 30. Both decide to start a modest investment plan and are committed to investing $2,500 a year until they’re 60 (Jessica will make lifetime contributions of $100,000, while Chuck will invest $75,000). Given their long time horizons, they both intend to invest in equity funds. 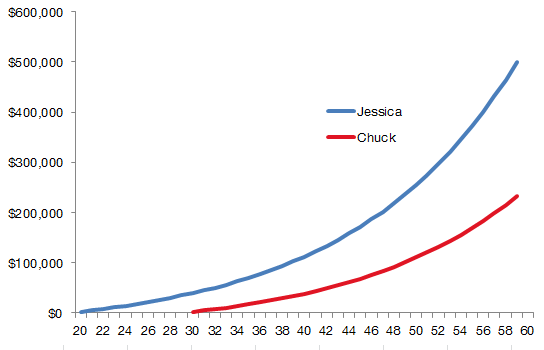 Assuming Jessica and Chuck invest in the same funds and earn an average annual return of 7% (after fees), Jessica will have amassed a nest egg of almost $500,000 when she’s 60 while Chuck’s portfolio will have grown to roughly $236,000. Jessica’s 10-year head start, and the power of compounding that goes with it, puts her at a significant advantage. Although she’ll only contribute $25,000 more than Chuck over their lifetimes, her portfolio will be worth over $260,000 more. If you have children who are entering the working phase of their lives, we encourage you to give them a nudge (maybe even a helping hand – we were all young once!) and make them aware of this opportunity. As always, feel free to contact us at 1-888-888-3147 or info@steadyhand.com if you have any questions about this initiative.